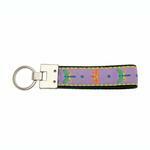 Keep your keys handy with this dog collar-like key ring. The Dragonfly Key Ring from Up Country is a great way to keep track of your keys in a stylish way! The handle is just like a dog leash piece! Made with durable zinc and iron hardware and high tensile nylon webbing with sewn on ribbon. Makes a great gift for any dog lover! The St. Patrick's day shirt brought me to your site. It is out of stock, but hopefully will be back in stock soon. We have Show Dog and are going to have the solid one's monogrammed.